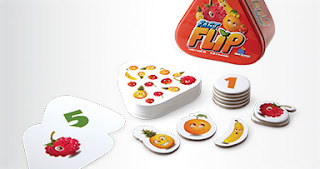 Fast Flip is a fast-paced matching race that develops high level visual processing skills while players quickly spot and count different fruits on the cards. There is always only one solution between cards, creating a fun and addicting game for all. Play with the cards alone or mix up your game with included tokens for more exciting and exhilarating fun. This was a fun game for us to play with my younger daughter. She was able to grasp gameplay very quickly, and there was enough chance to equalize the paying field, with enough skill to make it interesting. The small card size and sturdy tin make this an excellent game to take along while traveling - it'll be on of our road trip games later this summer! Be the maddest scientist around! Dr. Eureka, designed by the award winning Roberto Fraga, is a tactile problem solving and brainteasing matching game. Players pass colorful molecules between test tubes to match the pattern on a challenge card, building both cognitive processing and dexterity skills. 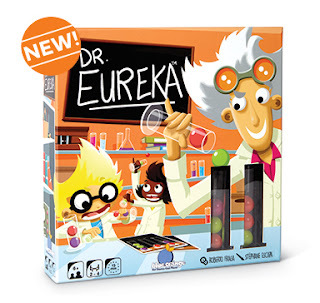 Play it alone or at a party with friends, Dr. Eureka is your best bet for some crazy molecule juggling fun! My eight-year-old really enjoyed this game. My younger six-year-old could play it with help. I enjoyed how the game could be played cooperatively or competitively, and it was challenging for adults but not impossible for children either, so the whole family could have fun with it!